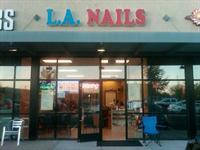 LA Nails is a Salon facility at 4280 N Oracle Rd #130 in Tucson, AZ. Services LA Nails is a salon in Tucson, AZ 85705. Salons like LA Nails offer services that often include haircuts, nails services, waxing, manicures and pedicures. Was this salon easy to locate?